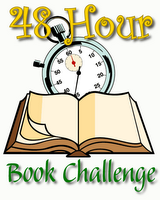 Mother Reader's 24 Hour Book Challenge is coming up soon. I had started a nice little pile of books that I wanted to devote myself to for that weekend. Well, best laid plans and all that. Turns out we will be a'voyaging to Washington D.C. the week before and we will be flying home on the 9th. So, my challenge will be to read on the plane and while doing laundry when we get home. Maybe I will receive honorable mention for the most number of pages read at the highest altitude? We are all very dizzy with excitement. I have only been to Washington D.C. once and that was as a chaperone on a high school band trip in April 2001. The youngest entling has never been there so we are having great fun reading guide books and making our lists. The Folger Shakespeare Library, the Library of Congress and Ford's Theater top my list. Ever since I read James Swanson's riveting page-turner, Manhunt: The 12-Day Chase for Lincoln's Killer last year I have been anxious to see the theater where the drama began. Please note: Ford's Theatre Historic Site will be closed to the public through November 2007. There will be no performances or tours during this time. We will reopen in November 2007 for our production of Dickens' classic A Christmas Carol. Please check back for updates throughout the summer. I don't know, Camille. I'm going to be reading on a flight from San Jose to Boston. I might give you a run for your money on that high altitude honorable mention contest. But seriously, have a great trip! - A visit to the National Archives to see the Declaration of Independence and the Constitution is a must-see (besides the historical value, kids who have seen National Treasure will get a kick out of it). - The International Spy Museum is definitely not free, but it's fascinating. Thank you so much for the suggestions. I will take any advice or ideas folks have. I think the Spy Museum sounds like fun! I live in D.C. and thought you might want to hear about several good local bookstores. Politics and Prose, which is metro-accessible via the bus system, is the best, I think, with speakers every day of the week and an excellent children's section. Olsson's is a local chain with locations in Virginia (including National Airport), Dupont Circle, and downtown (near the Spy Museum). Feel free to drop a line if you'd like other recommendations. Oh boy, that was going to be my next question...bookstores! I've probably seen Politics and Prose on C-span. Thank you so much for these recommendations. I saw Manhunt in my hometown bookstore last summer & thought that it looked really interesting. I'm hoping it comes out in paperback soon!